Mini Monets and Mommies: Thanksgiving Table Toppers Kids' Art Activity, With Turkeys! Thanksgiving Table Toppers Kids' Art Activity, With Turkeys! Thanksgiving table toppers range from perfectly pricey little pieces to handmade (or rather, kid-made) creations. When my son was younger we used to make crafty little place cards, napkin rings and other holiday accessories every year. These turkey-themed notecards are a favorite. 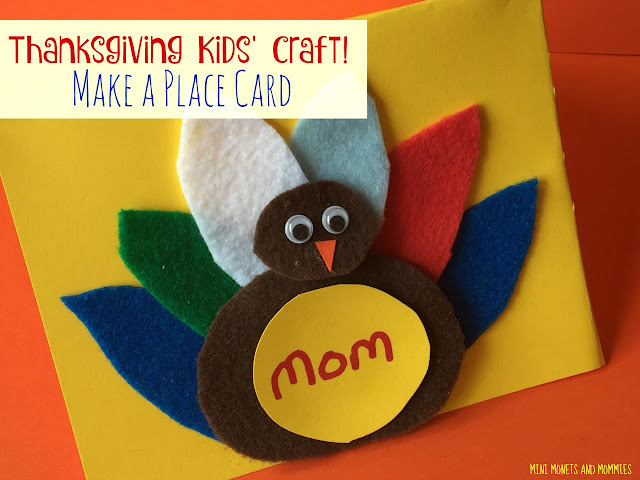 Not only does this Thanksgiving art activity result in a cute little craft that helps you set the holiday table, but it also gives the kiddos something to do while you prep for a mega meal. Gather the family in the kitchen and start the crafting as you prep for Thanksgiving dinner. This gives you the chance to supervise the kids and join in on the art-making too! 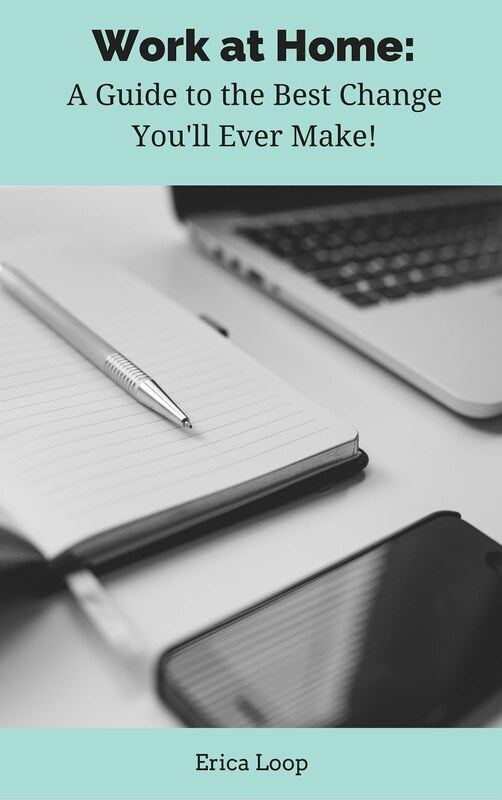 Assign each child a family member or guest to create for. Even if there are only three of you having a family meal, your little artist can still craft up a card for you or your spouse. 1. Position the card stock paper vertically. Fold the paper from the top to the bottom. 2. Cut the paper at the fold. Now you have two cards for two different family members or guests. 3. Fold one of the card stock pieces in half (from top to bottom), making a tent shape. 4. Cut two circles from one of the felt sheets. Make one bigger than the other (both need to fit on the front of the folded card). The smaller circle is the turkey’s head, and the bigger one is its body. 5. Cut ‘feathers’ from other colors of felt. Have your child draw and cut oval shapes. 6. Glue the feathers to the front of the card, making a fan. Overlap the edges a bit. 7. Glue the turkey’s body onto the center of the feathers. Add the smaller circle (with glue) to the top. 8. Draw and cut a small triangle from another piece of card stock paper to make a beak. Glue the beak to the turkey’s face. 9. Add two googley eyes with glue. 10. Write the guest’s name onto another piece of card stock with a marker. Cut the name out, making a circle shape. 11. Glue the name to the center of the turkey. Hey wait! Your child didn’t just make a cutesy craft, she also got in a bit of learning. She explored geometry (the turkey’s shapes), puzzled together pieces while learning about the part-to-whole relationship (when she put together the turkey) and even got in a mini writing lesson. 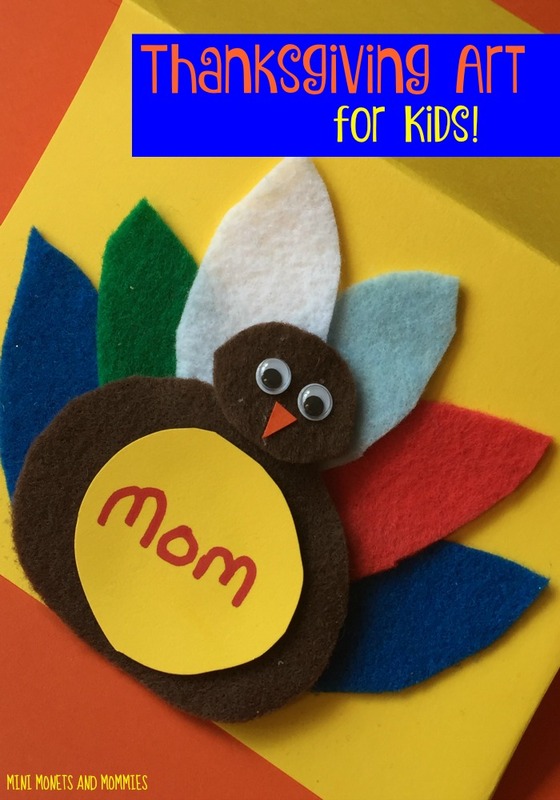 Are you looking for another Thanksgiving art activities for the kids? Follow my holiday Pinterest board for ideas! These are so cute! They'd be adorable as a card, too! Thanks for sharing at the Thoughtful Spot!